Plas Maenan overlooks the Snowdonia National Park and the river Conwy which winds its way through the Conwy Valley. Directly behind and above is Cadair Ifan Goch, a National Trust vantage point with fantastic views across the Conwy Valley and the Carneddau mountains. The walk takes in beautiful scenery and will take around an hour and a half. Trail maps are provided for guests. This is one of the most beautiful gardens in the UK, covering some 80 acres and situated above the River Conwy on ground sloping towards the west and looking across the valley towards the Snowdonia range. This is an exciting new surfing and water sports park to be built in the village of Dolgarrog, in the beautiful Conwy Valley of North Wales. Set in the foothills of the Snowdonia National Park, Surf Snowdonia will be a showcase for the World’s first publicly accessible Wavegarden artificial surfing lagoon. A great fun day out. Zip World includes a pair of zip lines, a mile long, where riders can exceed 100mph, 500ft high and experience the nearest thing to flying. The newest member to Zip World, Titan, opened June 2014 at Llechwedd Slate Caverns. This is the first 4 person zip line in Europe and the combination of Velocity and Titan makes North Wales the zip line capital of the world. The famous “Bounce Below” is part of Zip World. Set within a historic disused slate cavern, installed with massive bouncy nets to jump around in, unlike anything seen before. A trip back in time. Traditional Welsh bedspreads and tweeds are manufactured from the raw wool. Most of the textile machinery is over 50 years old and is powered by electricity generated by vintage turbines. A brute of a fortress. Caernarfon Castle’s pumped-up appearance is unashamedly muscle-bound and intimidating. Picking a fight with this massive structure would have been a daunting prospect. 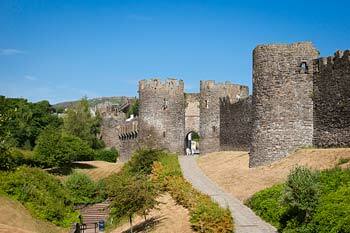 By throwing his weight around in stone, King Edward I created what is surely one of the most impressive of Wales’s castles. Worthy of World Heritage status no less! Is part of a living, working slate mine still being worked to this day by Greaves Welsh Slate – since 1836. They offer 2 unique underground tours that take you deep underground to explore the world of the Victorian slate miner. The temperature underground is an ambient 54F making the caverns ideal for a family day out – come rain or shine. This is a high level adventurous journey through the trees that involves negotiating a series of obstacles. Participants are fitted with a harness and helmet and attached to a safety line. Voted Best Family Attraction in North Wales for 2012 and 2013, days out don’t get much better than this! Jump aboard the world’s only people powered roller coaster, zoom down the longest sledge run in Wales, embark on the Jungle Boat Adventure (a challenge for the whole family) and discover the big, bouncy Giant Jumper. Plus, explore the turrets of TreeTop Towers, take off your socks and shoes for the BareFoot Trail or take a ride on the fabulous Moon Karts. Snowdon’s so big and so varied in terrain that it would be a real shame to walk up and down the same path in a day! The Snowdon Sherpa bus network is your passport to total freedom. Why not hike up one path and come down another? Or take the bus from your accommodation and walk back? It’s easy with the Sherpa service. The Snowdon Sherpa shuttles around the base of Snowdon connecting all 6 main footpaths and the surrounding villages. One of the most popular attractions in North Wales, the Welsh Mountain Zoo contains some of the most endangered species from Britain and around the world including Snow Leopards, Chimpanzees, Red Pandas and Sumatran Tigers. With three fully stocked fishing lakes, reptile center and childrens play area this really can be a fun day out. You can even enjoy a dutch pancake in the restaurant afterwards. Why not leave the car behind and take the train? Just walk down Plas Maenan’s tree-lined drive to the request stop and take the train in either direction. 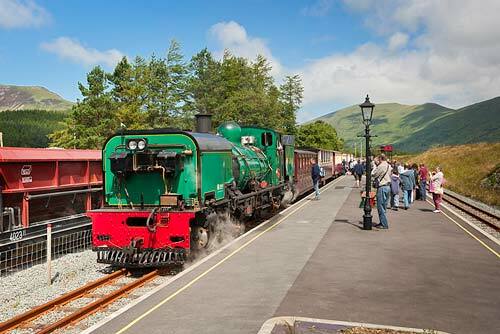 You can join the the Ffestiniog Mountain railway and steam through some of the most beautiful scenery in the world, stop off at Betsw-y coed, visit Porthmadog, or the famous Italian village of Portmeirion, go shopping or visit the pier in Llandudno – the choice is endless. Less than an hour away, why not take the car to the park and ride and spend a day exploring historic Chester famous for its two-storey Tudor shops, roman remains and castle walls. 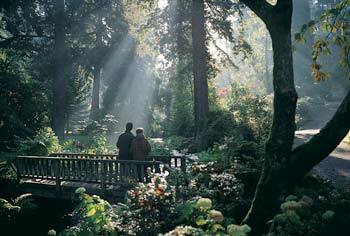 Alternatively, Plas Maenan is just ten minutes away from the stunning gardens of Bodnant and whilst you are there don’t miss the recently opened Welsh Food Centre – too good to miss. Address: Plas Maenan Country House Conwy Valley Nr. Llanrwst, Conwy, Conwy LL26 0YR UK.